This book has now been updated in Volume 2 (2014), with some additional new materials, some new positions, and the benefit of XG rollout analyses that were not available in the early 1990's. 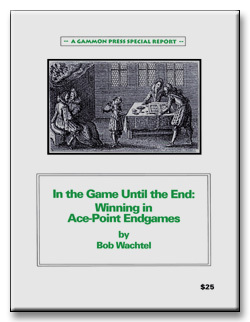 Most readers, if they were only going to read one book, would opt for Volume 2; however, some might well wish to have both volumes to have a comparative history in the growth and development of the analytical and technical aspects of the game. AUTHOR: Born just too late to participate in the ultra-cool Beatnik culture that flourished in his native New York in the early 1950s, Bob Wachtel adolesced in philosophical solidarity with that great hipster poet and railer against authority, Bob Dylan. The "radical" persona he displayed by imitating his namesake indeed lent Bob some provisional credibility among the naive counterculturalists in the chaotic, drug-addled "youth revolution" that was soon to surface; but he proved unwilling to adapt to the chilly economic realities that dispatched that daydream so mercilessly. Continuing to raise an angry fist against the demonic specters, Responsibility and Conformity, Bob remained one of the few Boomers who didn't "get it," all through the self-creating Seventies and the "help yourself" Eighties. Apparently indifferent to the considerable wealth that his better-adjusted contemporaries have amassed, he has pursued a series of arcane and unremunerative projects, of which this mongraph is typical. Bob currently lives within an easy commute of the eccentric community of Venice Beach, California, where he regularly joins a handful of fellow zealots in playing an exceeding rare racquet sport, called "Paddle Tennis." He maintains that his status within this cult, as a solid "B" player, is no longer challenged.